Uniting Kids and Teens Since 2002! Get games, tips and more! Visit our blog for great tips, resources, game ideas, and more! Below is a sample of some of our most recent entries. 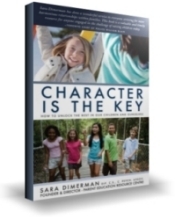 Character Is the Key is a book on how parents can model character for their children. Dynamix, in collaboration with the author, created family challenges and exercises to help families come together so that they can enact and fully understand the ten crucial character attributes. You can find Character is the Key at your local bookstore and online retailers such as McNally Robinson, Amazon.com (USA), Borders.com, Amazon.ca (Canada), and Indigo.ca. Sign up to receive great ideas, tips, specials and more! © 2019, Dynamix Adventures Inc. All rights reserved. The leader in teambuilding and character development for kids, teens and all professionals in the youth sector. Character Education, Leadership, Teamwork, Team Building, Kids, Children, Teens, Families, Schools, Retreats, Birthday parties, After-School Activities, Montreal, Toronto, Canada, Adventure, Challenge, Kidvivor.